Re: Any other RVers here? I would think that remediation of ^ aforementioned issues can be done, and should be fairly simple. Change the materials and keep things ventilated. Check all 'filters' also. Air handling systems on these things can be changed out and upgraded. And I'm sure there are many DIY's out there. When we camped, I cracked the roof vent in the bedroom and had a small, battery operated fan going. That seemed to help. My fear of waking up in the morning with my lungs clogged didn't happen. So, never fear! Any kind of mod I contemplate has probably already been done. Told Dh that we can do our own jiggery pokery to be able to convert the area back to a dinette when needed, 'cause I'm not going to just toss those cushions. I sat on the green one at the store It was surprisingly comfortable. I almost bought one. I have enough of chairs. But now I do want it again, ha. Or - maybe DIY something with bungee? Yeah, I come up with some far out ideas myself. Which sound good but are largely impractical or would be a huge PITA to do. And might not work. Simpler is often better. And, now that I'm Older and Lazier - Simplest and Easiest is usually my first choice. For the cost involved in this - two bucks - I can throw it out and make another. Thought of because this reminded me that - there's got to be 'resistant' materials out there! I know there exists 'mildew resistant' fabrics etc. One moar thing that I thought was kinda funnee - I've being going to a local Ace hardware store here lately, rather than the big box ones. They're not that much more expensive and they seem to have more things. Or, the one I've been going to has a green house and 'garden' section too. Which suits me better for a small bag of potting soil, I do not need gigantic outdoor bags which is all they seem to have at places like HD. Actually my Mom arm twisted me to go there - she was in town and looking for a gift for my Aunt. But first she had to drag me through all the local HD's and Menard's and what have you - *looking for a Garden Gnome*. For some reason she thought that's what my Aunt would want. Ah - OK. And not only could we not find *any* of these - what few we did see were CRAPPY AND EXPENSIVE!!! Like $150! My Mom just wanted a simple little gift, we're not overly big on all that. So then she wants to give one last try at this Ace Hardware she passed ~ I was reluctant because I thought they were expensive and didn't have much. So we go there - they have alot of stuff, and plenty of sales items. And a whole 'garden' area. And we found this ceramic bird feeder - a puffy Cardinal / Red Bird, about the size of a small pumpkin, it's hollow and the birds can fly right in Came with some length of chain to hang it. 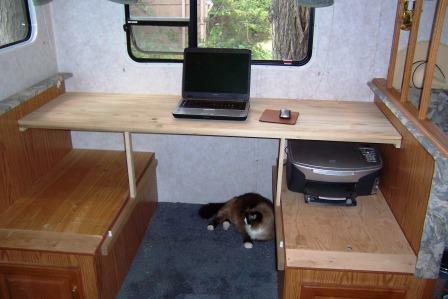 RV desk for me. The dinette was pretty much scuppered as being too uncomfortable for any use, so we felt free to make modifications. I didn't want to lose the storage underneath the seats and, with the seat cushions in, the part that is still available makes decent guest seats. The frou-frou chair was tried and discarded as too big and not comfortable for long sitting sessions. I bought a small, rolling desk chair from Staples. 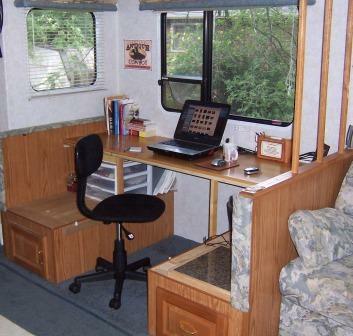 One book on RVing (although I wish it were updated as to internet/electronic/etc type things), is Take Back Your Life! 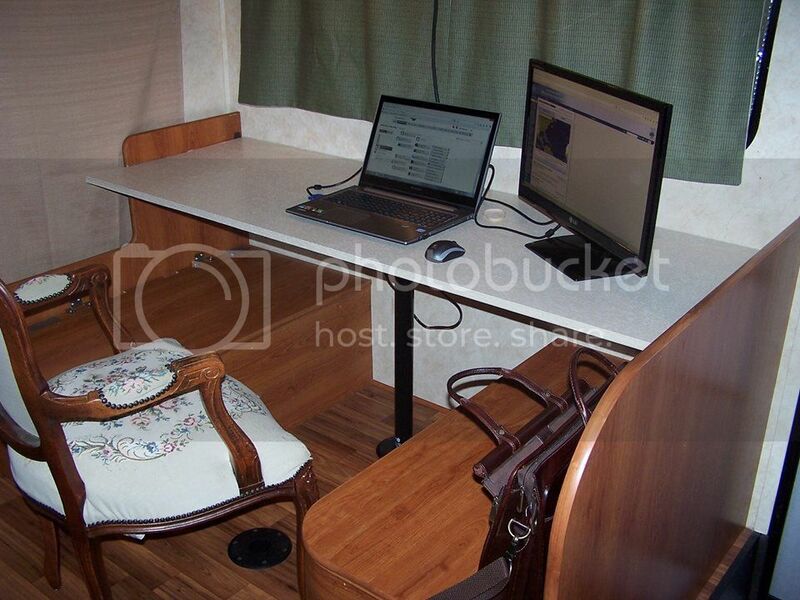 Travel Full-Time In An RV by Stehanie Bernhagen. It is the best one I have read (and believe me I have read them alllllll), filled with common sense info. Also, when you make curtains, hope you put some kind of blackout AND (washable) thermal backing. When parked for the night you don't want to see the headlights or porch lights of others blasting in, and also to help keep it warmer in winter, cooler in summer. Most RVs don't have double-panes either, and are not very well insulated (sorry to mention it if yours does and is considered "all weather", but the pictures in your posting doesn't show for me to help me out on that). I have down comforters to help me out with the cold-and the cats of course. I took out all the propane (makes me nervous) and put all electric in for heat and water heater. And a bunch of other mods, like a china toilet with rinser (the other was 1980s plastic UGH). I actually wish house toilets had that foot flusher-much more sanitary!!! I could go on forever about it, but do wish you and your hubby and fuzzies well on your RVin' adventures! Heyyyy! Where'd my pictures go! That's what I get for reorganizing my photobucket stuff. I'll have to find them and put them back. I have read soooo many books over the last 20 years, including the one by Bernhagen. How To books, personal odysseys ... Now that the internet is around, research got a lot cheaper. And yaaay! for FB groups. Instant answers (and too many unwanted opinions) on a number of issues. The propane thing makes me nervous. I have seen too many accounts of fires - especially ones that seem to have been caused by refrigerators. Curtains are lined, but we have the double layered aluminum that has the bubble wrap in the middle. We noticed it made a big difference toward insulating the windows. Dh cut each piece to the shape of the window. 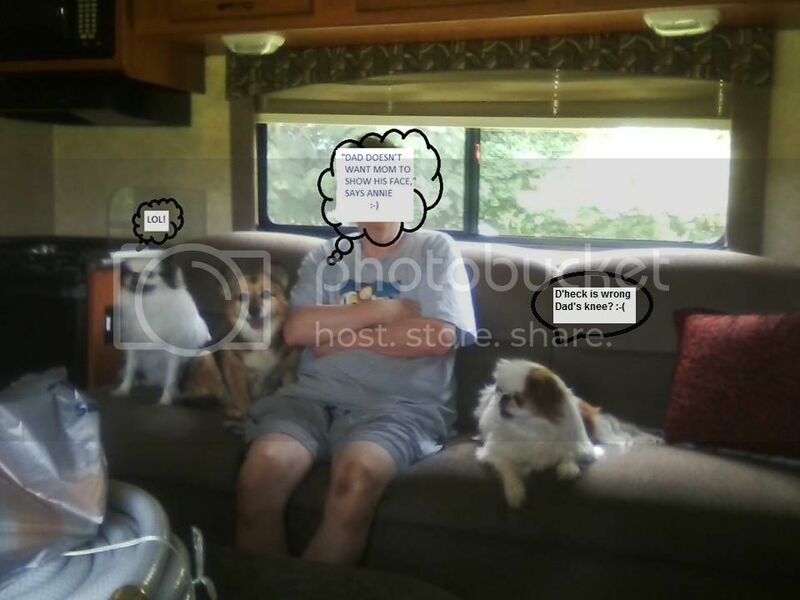 We've been doing local camping so I can't say that we really have experience as RVers, yet. This May we plan a three week trip from the East to the Midwest and back, taking mostly secondary roads. Now I need to go find those pictures ... what did I do with those darn things ..
Did you guys make it to the PNW? I'm seriously considering buying a mini motor home and making my way that way. I have lots of questions for you...don't know if I should post them here are take it to PM.